Quit Victoria is urging former smokers to resist the urge to light up this festive season, as new figures show thousands of people across regional Victoria are quitting and staying quit. New figures from the Victorian Smoking and Health Survey show that in 2017 around two in three regional Victorians who have ever smoked had been quit for at least a year. Quit Victoria Director Dr Sarah White said it’s positive to see so many Victorians kicking the habit for long periods of time. “It’s fantastic to see that the quit message is getting through and that so many Victorians, particularly in regional areas, are managing to stay quit for a year or more,” Dr White said. But with the festive season often providing a mix of social events and stress, Dr White said it’s vital for former smokers to be armed and ready to resist the temptation to light up. “At this time of year there are plenty of temptations for former smokers. Social events, like Christmas parties, BBQs and drinks with friends, can be risky for former smokers, as smoking and drinking often go hand in hand. The desire to light up can be heightened if your friends or family smoke too,” Dr White said. Quit recommends having a plan in place to reduce the risk of relapse, if or when the sudden urge to smoke strikes. This plan can be as simple as: ‘If I am tempted to smoke at [insert situation – eg at a friend’s Christmas party], I will [insert your planned action – eg listen to some relaxing music, read a book or call a friend]’. “If you’re trying to stick with quitting, have some strategies up your sleeve to help when cravings hit. Deep breathing or distractions, like a podcast, a walk around the block or a quick call to the Quitline, can help you overcome stressful or social situations without cigarettes,” Dr White said. 1. Chill out: Put some calming tunes on and (try to) relax. Get rid of any ashtrays and lighters if you haven’t already, and grab some candles or an air freshener to cover up the smell of smoke. 2. Find someone or something to distract you: Grab a book or magazine, cook a healthy meal or call a friend. Do something to occupy those crucial minutes and keep yourself busy. 3. Keep your hands busy: Flip a coin, squeeze a stress ball, grab a water bottle, pat your pooch or pick up a pen and start doodling. 4. Keep your mouth busy: Think gum or lozenges, sip some water or eat a healthy snack like nuts or fruit. If all these don’t work, try brushing your teeth. You will feel fresh and clean and hopefully the cravings will have passed once you’re done. 5. Get outside: If you’re feeling stressed, go for a brisk stroll around the block or do another form of exercise. Make it something you enjoy like yoga, kicking the footy or boxing. Grab a mate to help keep your mind off the smokes. 6. Plan ahead: If you know you’ll be craving a cigarette at a certain time, place or in a situation, prepare and change up your routine. Try a fast-acting form of nicotine replacement therapy (NRT) like mouth spray, gum, lozenge or inhalator a few minutes before you think a craving may hit. Combination therapy – using patches with a fast-acting NRT product – is one of the most effective quitting methods. 7. 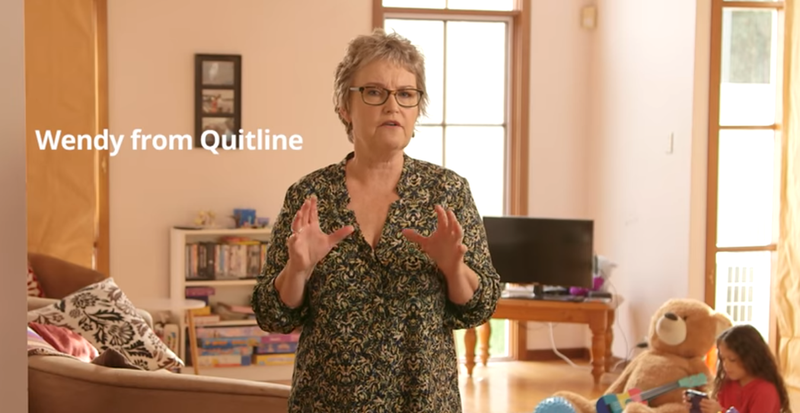 Call the Quitline (13 7848): Our trusty Quit Specialists are trained to support you through this. You can request a Quitline callback if you prefer. Started smoking again? Don’t fret! Relapse is a normal part of stopping smoking. In fact, research shows people try up to 30 times before quitting for good. Head to the Quit website for advice on how to get back on track. *In 2017, 63.1 per cent of regional Victorians reported being quit for at least a year. The Victorian Smoking and Health Survey Research Brief: Smoking cessation in Victoria, 2015-2017. Conducted by Cancer Council Victoria, the VSHS survey is a cross-sectional, annual telephone survey of approximately 4,000 randomly sampled English speaking Victorian adults.